Back to the set design course at St Martin’s. This intensive week of study at the beginning of August was fabulous – from start to finish. I learnt so much – and I am still learning as I continue with the tasks set by the course tutor (along with a few other related matters). Straight away, that Monday morning, we were set to work. No time to be wasted. After a brief get to know each other session, Gary (Thorne, our tutor) described our first task. We were to measure ourselves. It is not often that one is required to know ones height exactly, so we all stood up and measured each other. I measured 1.70 metres. Armed with this measurement, we were to draw some tiny self portrait sketches to scale. My drawings were pretty awful, which I am sure prompted a comment from Gary to the class that some of us could do with some life drawing sessions! I don’t disagree with him, not having been to one for many years. 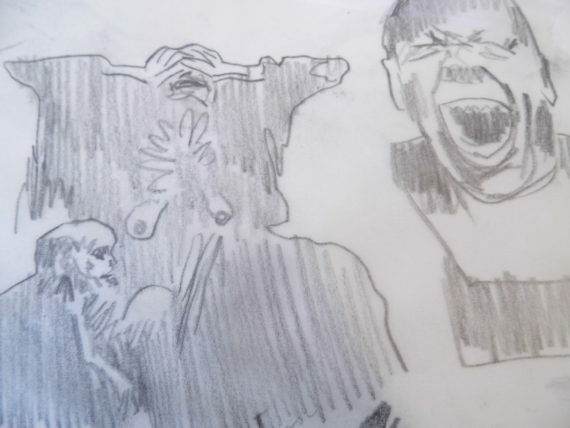 My practice hasn’t required a sophisticated figurative drawing technique for some time and it may explain why I am struggling with my book of little self portraits – but that’s another blog for another time. Back to the scale drawings. 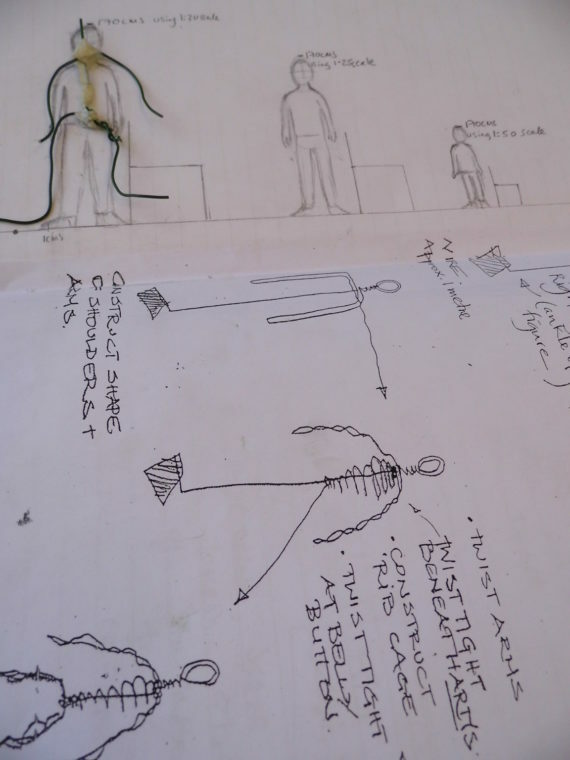 One of the fundamental principles of set (and costume) design is to know how to draw and design to scale. Set and costume designers usually work to the scale of 1:25. Sets being any – stage, film, television and exhibition. With this universal principle, ideas can be accurately and sensibly conveyed to production teams, who translate your ideas into real scale. Math’s isn’t my strongest point. I know enough to get by. CSE Grade 2 is all that I managed at school (that’s a D in O’ Level, maybe at a stretch C at GCSE, 4-5 in new money). Once I have got my head around a principle, I am ok – but when feeling under pressure I suffer from what many of us do – Math’s Panic – your brain freezes and someone is talking to you and you can’t quite hear them or you can hear them but all of their words sound like complete gobbildy-gook. That is what I experienced when Gary was explaining what we needed to do in order to use the scale rule – i.e. we needed to convert our real height into various scale measurements, i.e. 1:75, 1:50, 1:25 and 1:20. There is a way of doing this using mathematical formula, but if armed with a scale rule and you know how to use it and are able to use simple division, then you should be ok. But I got stuck on all levels – concept, division and how to use the ruler (it isn’t any old ruler – it has six edges!) However, with some patient tutoring from Gary and help from my fellow students, I cracked the code – and can now use a scale rule with ease. Yes, I have my very own scale ruler. And this is something I am very proud of. Upon leaving the course, I was armed with a long shopping list of set designer items that would be extremely useful for me to have. I was accepting of the knowledge however, that it may take me some time to acquire these – funds were at an incredible low and paying the rent and providing food for the table, was, for the next few months, a priority. A scale rule and all other items would need to wait. But what did I find when sorting through my late grandfathers things? When my Nan died in May, we not only had to sort through her things, but also my grandfathers, who had died in 2001. My grandfather (grandpop) was a draughtsman, designer and artist. When alive, he would love to talk to me about the Golden Section and Fibonacci Numbers. He even gave me an old tool to measure the golden section. With regret, I don’t think I appreciated this at the time. 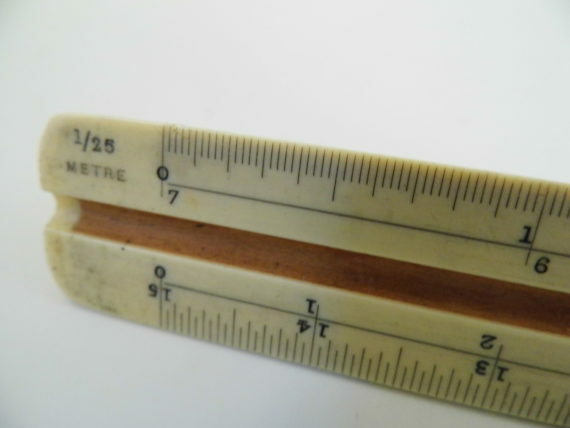 However, this week, while sorting through bags that I had swiftly packed back in the summer (before the course), there amongst Grandpop’s design tools was a scale ruler. I had no idea that it was there! And to use an overrated expression – my heart leapt with joy! And here it is – my Grandpop’s Scale Ruler, and there it is – the 1:25 scale. After we learnt how to use the scale ruler, the next stage was to learn how to make a model figure based on our 1:25 scale drawing. Gary swiftly led us through his technique, involving one piece of wire and a bit of masking tape. It was like watching an origami performance with wire. The wire was wrapped, bent and twisted to form a figure, complete with a base on which to balance on. Luckily we were provided with a guide sheet as to what was to looped where, otherwise that was something else I would have struggled on. Back in the studio and inspired to use the scale model technique to create little figures for an art work, I used Gary’s template as the basis. Even if off task, and not with the right materials and being baseless, it served as a useful practice. After the wire stage, we practised using modelling clay to build up and characterise the figure. 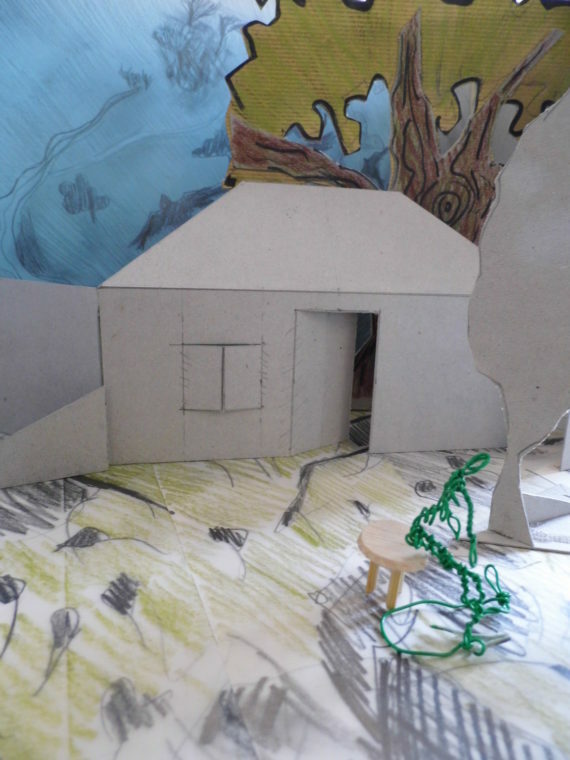 Using model figures in a stage set, helps to imagine the actors within the setting and to visualise the scale of the designs. Designers use their own heights to begin with and then alter designs to fit the actors heights later on in the process. At some point during the first or second day, Gary introduced us to the play that we were going to basing our studies on. It was a wonderful version of Hansel and Gretel adapted by Carol Anne Duffy. A short play, but packed with atmosphere and plenty of room for creative interpretation. As with any play, there is a target audience. This version of Hansel and Gretel was aimed at children and families 7 yrs and over. Many fairy stories have a grim, horror element and many are based on real life events or familiar situations that are sad and haunting. But the horror or sadness is played out to the children in such a fantastical, or comical way that the truth is lost on them – and even at times the adults. The Brothers Grimm, who wrote the story of Hansel and Gretel, travelled around Germany and collected tales. Their stories are then made up from a collection of these tales. The story of Hansel and Gretel is dark. It is probably based in Germany or countries in the Baltic regions, during the time of the great famine that happened between 1315 and 1322. Life was desperate for people during these times and families were reduced to abandoning children to fend for themselves, or were reduced to cannibalism. No matter how far down the track an adaptation may be, it is crucial that the origins of stories are investigated. This then provides a backdrop to the story and full research of the subject is where ideas for set and costume are gleaned. Of course, before you fully embark on detailed research, you will have gleaned some other basic key factors that will influence your decisions. You need to have done a site survey of the theatre, measured both the stage and the auditorium. You will have met with the director and sat in a play reading. All of this can happen concurrently and one of the most important things that Gary mentioned is that you will be working on all things all of the time. Read the script – have initial ideas – meet the director – they might have ideas of their own – sit in a play reading – ideas may change again – measure the theatre – ideas might have to be ditched due to restrictions – research the play – you might unearth things that then changes the way you are thinking – you get the budget – you have to re think again – you start to unit the play (more on that later) – but don’t get too into that as you need to test things physically – so play around with your sketch model box at the same time- you realise that ideas that came from uniting won’t work in the real space – re think – more research – re unit – come to some conclusion – meet director – re think again – meet the production team – re think again – and finally make the model box. Apparently it is a whirl of activity and also, you may be working on more than one project at a time. 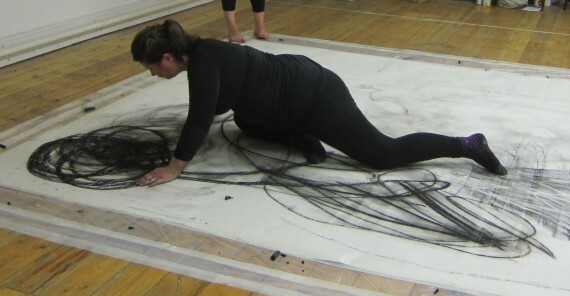 Gary described a working studio – walls covered in uniting sheets, reams of drawings and sketches and research notes, scale drawings of the theatres, model figures laying about and discarded thought processes in the form of bits of grey board shapes, string and coloured paper. I am exhausted at the mere thought of all of this! A nightmarish vision; A few Domestic objects to create the scene; It’s a story of starvation and terror; Strong feeling of chiaroscuro; Reminds me of a Gothic Horror or the film Metropolis. Gloomy sparse woodcutters cottage; Deep woods that get deeper; Need to show time passing on – Daylight – Moonlight – Daylight – Moonlight; Birds; Pebbles; Path; Sparse; Hatred; Then stark contrast with the witches cottage – which is bright, colourful – grotesque colours – horrifically bright and gaudy; Then on the way back the forest becomes more colourful – rich in colour? Ends on a happy note; Full colour with jewels. HAPPY. We elected for parts in the play and read through it – twice. I relished in being able to indulge in a bit of acting (once upon a time this was a career ambition) A bit of characterisation from myself and others actually helped to frame the play in ones mind – brought it too life. It also helped to establish the rhythm of the play – the pace of it on stage – which can inform how you design the set. There was an ensemble of three as well as the main cast. There were lots of shadows and a strong contrast was needed in the design. Gary mentioned that a crucial role of designer is to think about light – how to turn on light out of blackness, how to create natural light as opposed to man made light. As designers we need to be clear about our vision for lighting when we communicate this to the production team. Gary wanted us to be clear where the turning point was – the catharsis? Who’s is the release? Or perhaps it is different for different people at different points? Germany; Starvation; Famine; The Middle Ages; Rain and Cold Temperatures; Couldn’t grow crops; couldn’t bake bread; Starvation – couldn’t feed yourself, so had to get rid of things, get rid of responsibilities – had to get rid of your children – or eat them. This was the grim and horrific reality of this time. Eat or die. Immediately, it goes from a fairy tale to one of absolute horror. This is a story for children but it portrays the true story of children being eaten. As a mother this is an unreal thought. I can’t describe it as unbearable thought- as for me, unbearable means that you have some kind of understanding of what that must be like. We hear daily about children in this country who go missing, who have taken their own lives, who are killed in knife or gun crimes, or are abused – these are real scenarios that happen to our children in this country. We know about the terrible plight of refugees and refugee children, and as parents in this country, we think to ourselves what we might do in that situation – would we send our children away in the hope that they can escape war and find a better life? We can imagine that – as we watch it on the news. But the reality of the famine in the 1300’s is not something that we can imagine, as it is completely beyond our experience or understanding – how does a parent begin that thought process, what are the precise conditions where they need to even contemplate such an act? We explored other historical references and how these related to the characters i.e. there was a lot of superstition and fear, people were often accused and tried of being witches, children at to be incredibly resourceful to survive and the father was a woodcutter so had possibly made his own house. As Carol Ann Duffy is a poet, their is a specific style to the play and the play illustrates strongly the sense of time: 1st Day, 2nd Day, 3rd Day. How as designers would we describe this? It is also described as Past Tense – that it is a previous life that is being reflected on. The play is all to do with imagination and as designers, it is what we do with that. It needs to be structured, giving the audience space to imagine. Imagination is key and in order to make full use of our own imagination, it is important to read any original works – so that we separate ourselves from the script, get rid of that adaptation layer, so that we create a space in which to use our own judgement. However, it is crucial that we understand any legalities associated with working from a script: the actors must speak the words that are written for them, production notes and stage directions can usually be changed – but with some exceptions (i.e. by law, all Samuel Beckett plays have to followed to the letter) – so check all the legal aspects associated with the play. When there is a rich language base within a script, then designers don’t need to always provide an image, it can be imagined, it can be played with i.e. a house doesn’t need to be a house. Materials don’t have to be the real materials, so the witches house, as it is gaudy, could be set in a shopping arcade or could be made of bright Lego pieces, instead of looking like cake and sweets. Potential problems always need to be considered, such as portraying complex characters, conveying a particular emotion to an audience, how to change set pieces, how to convey travel, how to reflect what is happening in today’s world and society, how do things appear on stage – how do they get there? Through considering these problems, it opens up questions in creating inventive methods while continuing to suspend disbelief. 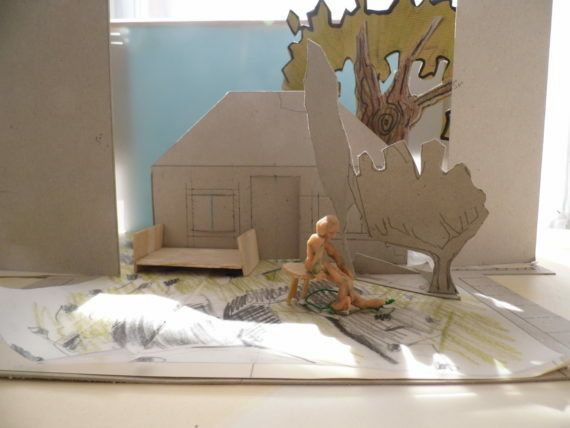 Can shadow play be used, projection, mime, can the stage set be multi purpose? A key question is how to use less for there to be more? A pathway of thought is established: how to economise, think the obvious, then consider alternatives. The golden rule is that all plays need to be initially imagined as written and then they can be manipulated to create another world or time. Carol Ann Duffy’s version of Hansel and Gretel has the father narrating at the beginning ‘It was hard enough for him to feed them all at the best of times – but these were the worst of times…’ How visually can this be described? Is it cruelty or survival? We have to consider this very carefully. With the first scene, those first moments and words spoken, we need to grab the audience – we want them to have a strong initial reaction. Then build on this, by showing all the richness of contrasts within the play i.e. small house, huge forest and best of times, worst of times. 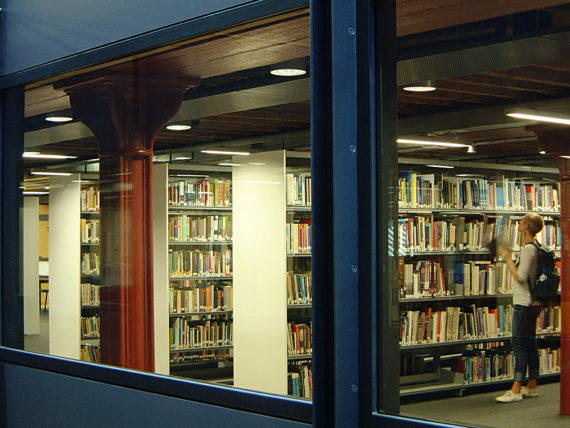 It was now time to conduct some precise research in the amazing library at Central St Martins. Oh how I have missed having access to such riches! We had an afternoon to look through as many books as possible, we delved through history books, costume, landscape, architecture, folklore, witchcraft, fairy stories, artists, designers, nature, animal, birds, insects…… anything that would provide an insight, provoke thought, inspired imagination, framed thinking and give context. 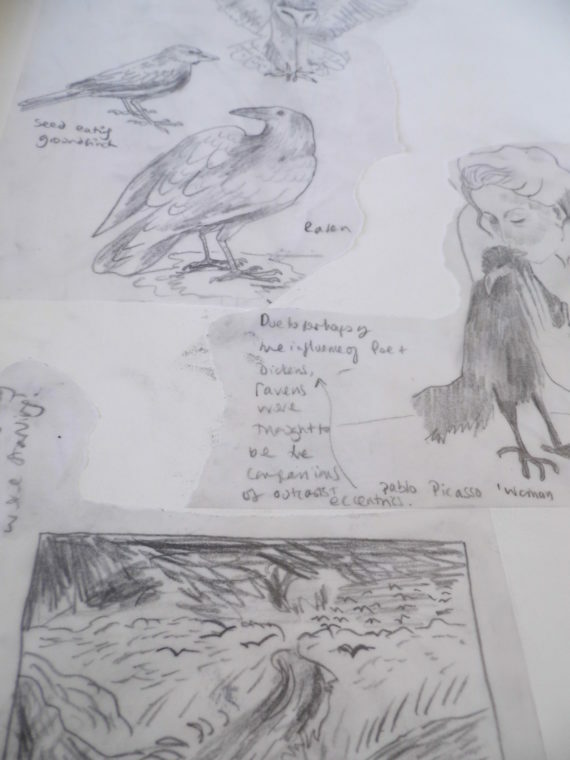 Armed with our sketchbooks, tracing paper and pencils, we set about collating as many images as possible. Uniting the play is a crucial task. As mentioned previously, this happens concurrently throughout all the other processes. When uniting, there needs to be a structured way of thinking, so that there is unity across the board. Everything is blocked into units: a unit can be a line in the script or a whole paragraph. My understanding is that a unit changes when there is a change in pace, character or action. Each unit contains ideas and information that are listed in sections, such as characters, lighting, set, props, meaning etc. This helps to look at layers within a plot and things that make the story more complex. It also helps to set out the play, work it out logistically. A crucial question would be – Is there a Pre Show? A pre show is where action and scenario takes place before the play is due to officially start – so, do you have happenings going on in the foyer of the theatre as the audience are collecting their tickets, or is something happening in the auditorium as they take to the seats? Or do you want to set an atmosphere gradually using lighting and sound? All the information needed for this goes within the unit of Pre Show. Gary showed us his method of folding an A2 sized sheet of newsprint to create a complex series sections. Each section had an approximate size that related to the size of each unit. To begin uniting the play, you go through the script and note onto the sheet where each unit starts and ends i.e. Unit 14 is P.5 L1 – P.5 – L.3. Each character has their own colour and it soon becomes clear through being able to see visually when each character moves on and off the stage. Throughout a play, the writer is taking the audience on an emotional journey. When uniting, an important aspect to consider is Mood and Tone. In this version of Hansel and Gretel, Unit 1 is 3 lines long. ‘It was no more than once upon a time when a poor woodcutter lived in a small house at the edge of a huge, dark forest’. In terms of Mood and Tone, there are two distinctions within this one sentence. ‘It was no more than once upon a time’ can be seen as inviting, cosy, magical or sad. ‘Lived in a small house at the edge of a huge dark forest’ can be modest, ominous, mysterious. As a set designer how do you convey these two distinctions in a short time frame? In the timeline of the course, I think at this stage we might have been midway on the penultimate day. 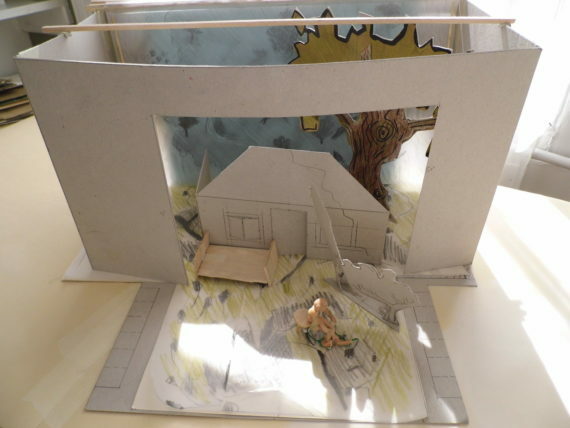 It was now time to learn how to construct a set model box. Something I have always wanted to know how to do. Gary gave us advice on how to measure in a theatre, told us that not all theatres have floor plans (some do just provide a list of measurements, from which you have to work out the plan yourself), he advised on materials and equipment to buy, provided us with all the necessary technical terms and wonderful drawings of the various stage formats available, such as Arena, Promenade and Thrust. 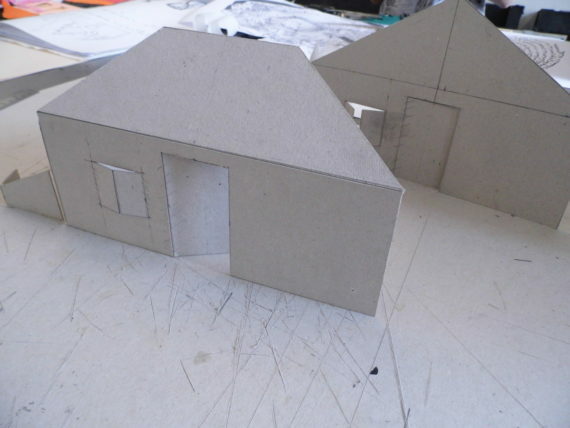 To make a sketch model box from the floor plan (once you have drawn that from the measurements ……. 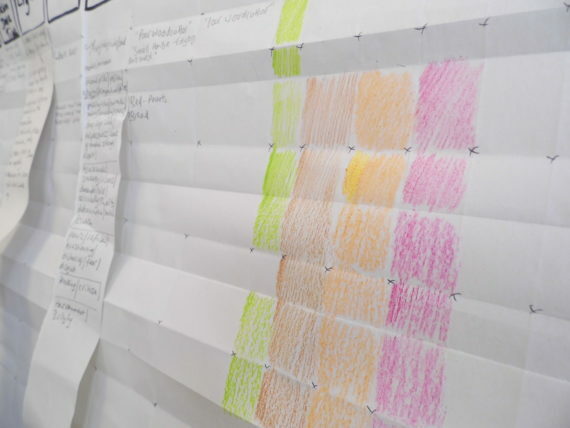 I can sense a spot of Math’s Panic returning), you lay the paper plan on top of your grey board and you pin through the main points of information. From here, you can cut out the base and sides of your sketch model box, then fix them into place. Then you play. Use paper, scrap and junk materials to experiment with ideas. This is when you put in an idea and throw it out just as quickly. And in real life, you would be doing this at the same time as uniting. The object was, that in our now limited time, we were to create a sketch version for the whole play. 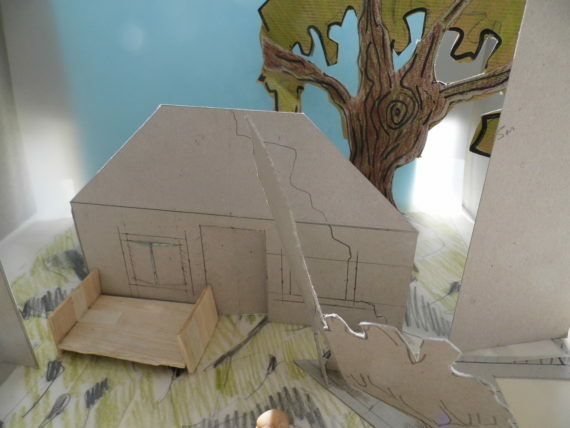 We were not to worry about specifics, if something looked like something or it didn’t, budgets or how a set consideration would or wouldn’t work – but we were to use our imagination and plot out the whole play. For some reason, however, I obsessed over a Pre Show element and units 1 – 2b only – which was only 1 page into the play. I made a woodcutters house – but it wasn’t the right style, so I made it again. I carefully made a tree that hinted at an Egon Scheile drawing and design style, but worried about how it would stand, I made some scale furniture and worked out how they would be brought on and off the stage, I plotted the action of the characters and how they would help to move the set. What I did do though as a contribution to the look and feel of the whole design was to create series of screens. These would be utilised from the start of the pre show and right throughout the play. Onto the screens would be a series of projections, using animation as a vehicle to establish atmosphere and location. Gary suggested I used the same effect on the floor of the stage, which would create a thoroughly immersive experience. Soundscape was to also play a crucial role in my design – and this would form an important part of the pre-show – setting the scene for audience as soon as they walked into the theatre. 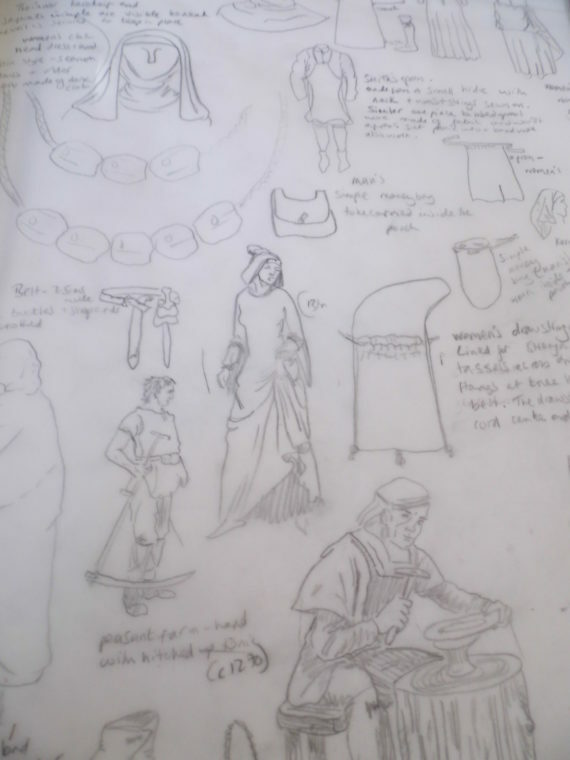 Gary made the observation, that drawing and my drawing style was underpinning the whole design. This was really useful and helped in the decision to use animation throughout the whole play. I am reticent at this point to go into any more detail about my design, as I am still working on it. 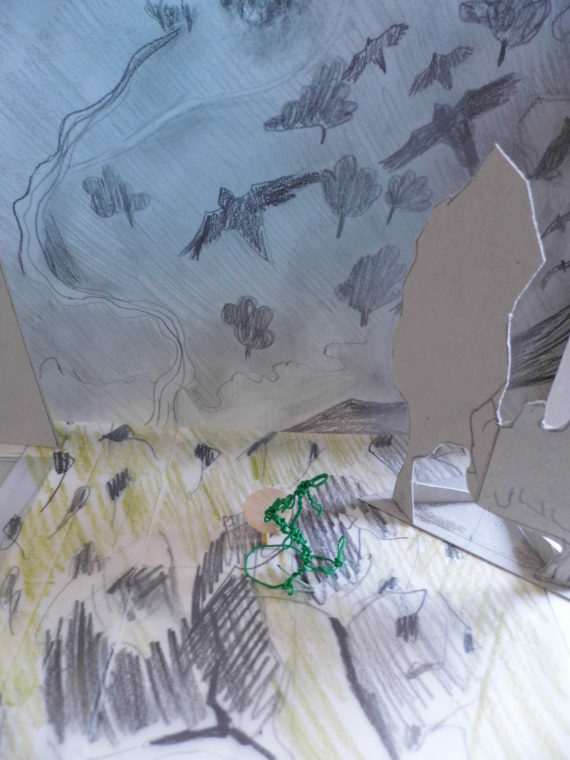 Our homework for the next year is to continue on our studies – and if possible unit and design for the whole play. This I intend to, so would like to only reveal then, the thinking behind the whole design. However, I will reveal the Pre-Show and Unit 1 – 2b in it’s current sketch model box form. 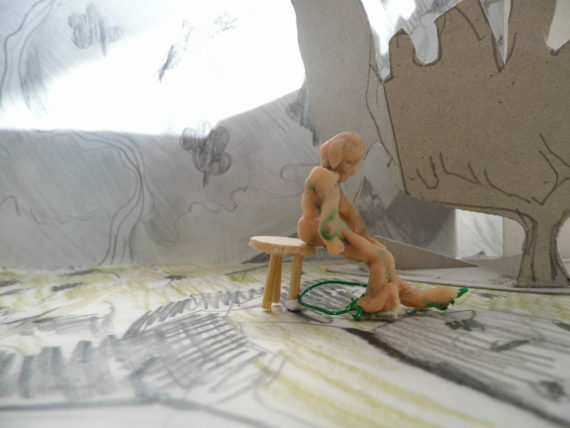 Pre Show – The woodcutter is sat on stage. The audience enter with the house lights on at 3/4. There is a soundscape of forest sounds. The woodcutter is whittling wood into the shape of a wooden doll. Behind him is a screen. It gradually begins to play an animation of a forest, flickering at first, but then forms appear. The house lights dim further, to 1/2 then 1/4. Slowly, on the floor a projection appears of a reflection of the forest canopy, flickering in the mid-light. The house lights go out. Slowly, the shape of a house is revealed behind the screen. The screen moves up and we see the woodcutters house set amongst some trees. Behind the house, the forest continues. Actors bring out the bed to the front of the house. This becomes the bedroom for the next scene. I learnt so much on this course. It has already been so beneficial and I have a much clearer and deeper understanding of the intricate processes involved in set design. 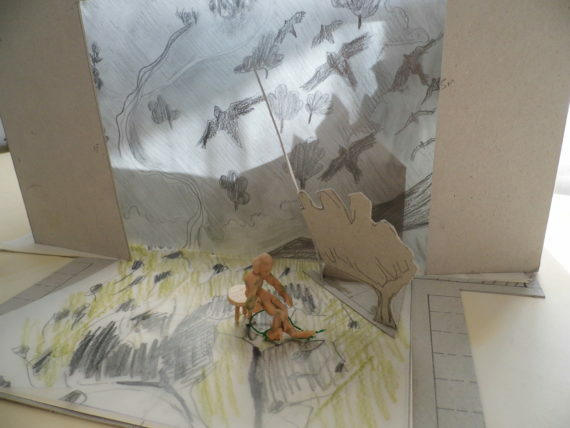 I am determined to complete uniting the whole play and sketch out the whole play in the model box. This may take a while as I work on this bit by bit alongside my other work in the studio. However, I can immediately apply lessons learnt to my studio practice, which involves the construction of dwellings and model figures. I can adopt scale model rules to these, which will make the process of designing and making much easier. I will be reflecting more on this experience with a longer term view in mind when I have completed all of the blog posts regarding my bursary activities (one more of those to go I think). This will also tie in with the reflective process that I have been engaged with since the mentoring session with Morag Ballantyne. I can say however, that this process, this whole year as provided me with a solid grounding with which to move forward.